This video compares the performance of Hubmann, Gueorgiou, Rollier and the other top runners in Sunday’s event on Le Revard by analyzing the Performance Index in WinSplits Pro. In this era of GPS analysis, many forget the value of analyzing the split times. There is however a lot of useful information hidden in the splits. The motivation behind this screencast is to show how the Performance Index can give you insight into the potential of different runners based on their current abilities – both running speed and o-technical abilities. This can be useful to assess the potential of yourself or somebody you coach if you are a trainer. The analysis is done in the program Winsplits Pro (which comes at a price of around 60 Euro) – a very useful tool by Mats Troeng – the man behind QuickRoute. I am no expert on either WinSplits Pro or the Performance index – if I missed something important, please add a comment below to let me know. PS! Screencasts is new to me – and I consider this as a test. Is this something which I should continue making at o-training.net for other topics as well? Does the format work? Too slow and boring? Warning: If you are not above average interested in orienteering analysis, this is probably nothing for you! No fancy moving stuff to keep your attention. Thanks for nice video. A bit long, but very interesting. I have not used winsplits, but I think I need to try it out. Interesting video, especially good in HD, so I could read all the text on the screen. From your analysis it would seem like the Swiss team will be very hard to beat in the relay. OTOH, as long as TG starts on the last leg within striking distance, he might get that relay gold which have seemed so secure, only to slip away for several years now. Hi Jan! Very nice video, but I think you have missed one rather important fact when comparing runners’ potentials. 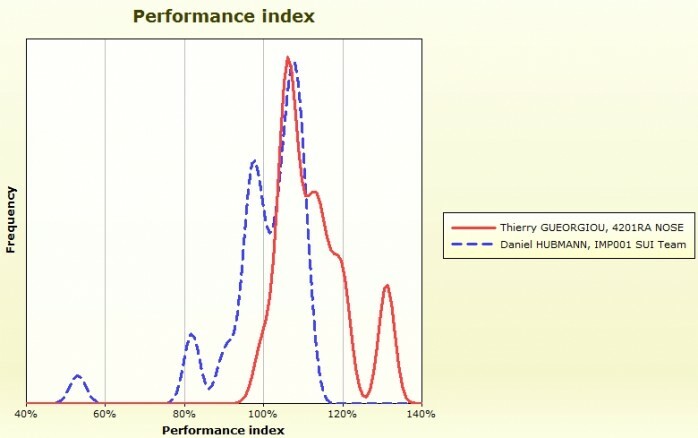 What’s interesting about Gueorgiuo’s performance is that his peak is very close to his “worst” legs, while for example Hubmann is the opposite. His peak is very close to his best! Hubmann has most of his legs at a very high level indeed, but he can’t do any better then that, and he also misses here and there. Gueorgiou on the other hand performs very steadily on almost the same level but have some even better legs on top of that! And that’s a major difference. @Awex: Thanks a lot for your comment! Good points there indeed. Still it is interesting to note that the “baseline level” of the two is closer than I expected from looking at the results. Agreed that lifting from below the baseline to above is extremely difficult – it looks like Gueorgiou runs on this high performance level with taking less risks than the others. What is effective technical training? Training Camp Time: Video-intro to 2DRerun! New version of QuickRoute and DOMA! Interesting new Orienteering Analysis Tools coming!